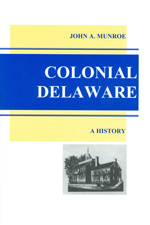 Delaware: A Guide to the First State was initially published in 1938, with second and third printings of the 1938 edition appearing in 1948 and in 1973. A revised edition was published in 1955. It was initially produced under the aegis of the Federal Writers' Project (FWP), a part of the New Deal's Works Projects Administration (WPA), which provided work for 10,000 unemployed or underemployed American writers from 1935 to 1943. In addition to Delaware: A Guide to the First State, the FWP produced 47 other state guide books, and about 350 additional volumes dealing with such subject units as natural regions, counties, municipalities, as well as oral histories on such topics as slavery and folk culture. The FWP was proud of its publications because they allowed "Americans [to] discover America." All of the state guide books were published between 1937 and 1941, and were widely praised with the Washington Post characterizing the entire series as "first-class literature." African American Education in Delaware: A History Through Photographs, 1865-1930, by Bradley Skelcher, Second edition 2007, 99 pp., HARDCOVER. Prices reflect the cost of the book PLUS S&H fees of $5. 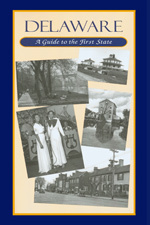 Notify me of updates to Delaware: A Guide to the First State, by the Federal Writers Project of 1938. Reprinted 2006, 549 pp., with pull out map, HARDCOVER. Prices reflect the cost of the book PLUS S&H fee of $5.00.